As described in Chap. 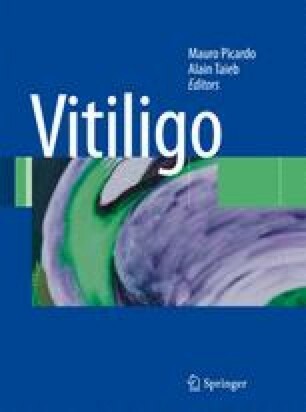 2.2.7, there is a large body of data indicating that vitiligo, at least distinct clinical subtypes of it, represents an immune-mediated inflam-matory disease. This concept is further corroborated by those patients who experience beneficial effects from anti-inflammatory and/or immunomodulatory treatment, for example, after therapy with corticosteroids or topical calcineurin inhibitors. In this view, different systemic imunomodulators have been proposed for the treatment of the diffuse form of the disease. Recently, the widely used a new class of immunomodulators in dermatology defined as biologics have been tested in vitiligo in a limited number of patients to assess their therapeutic potential in this disease.